(Newton, NC July 26, 2018) – Ricky Rude has had success at Hickory Motor Speedway before. Now he's hoping to extend his points lead when the Minimizer Bandit Big Rig Series returns to Hickory Saturday, August 11th . The Bandits were supposed to run on the World's Most Famous Short Track back in April, but Mother Nature had other ideas. "This is going to be an awesome event," Bandit General Manager Jason Johnson said. "The fans at Hickory are some of the absolute best, and I expect the Bandits will put on a heck of a show for them!" Rude (#14) sits atop the standings, but several Bandits are close behind, including Mark Noble (#74), Tyler Kruckeberg (#54) and Allen Boles (#3). Rude's #14 truck stole the checkered flag at Hickory last October, giving Rude a huge win on his way to the first-ever Bandit points title. Will history repeat itself in 2018? "I'm feeling good right now," Rude said. "I've got a truck that's in good shape, so we'll see what happens." Fans have sold out Hickory Motor Speedway the last couple times the Bandits have come calling. Organizers expect more of the same this time around. "North Carolina fans love their big rig racing and we love coming to Hickory Motor Speedway," Johnson said. "It never hurts to have some local favorites with you!" Jupiter Motorsports is located in Weaverville, North Carolina, approximately 90 miles from the World's Most Famous Short Track. Jupiter Bandits include Boles, Justin Ball (#17) and Marshall Davis (#41). Rude and Darren Proffitt (#27) also hail from Weaverville. In addition to the Bandit races, fans can expect several other activities that day, including a Bandit Party in the pits. "We'll have a DJ and live music, but it's limited to a certain number of tickets, so fans will want to purchase a Pit Party Pass as soon as possible," Johnson said. There will also be bounce houses for the kids, several vendors on hand, as well as the Minimizer Fan Series Truck Show. 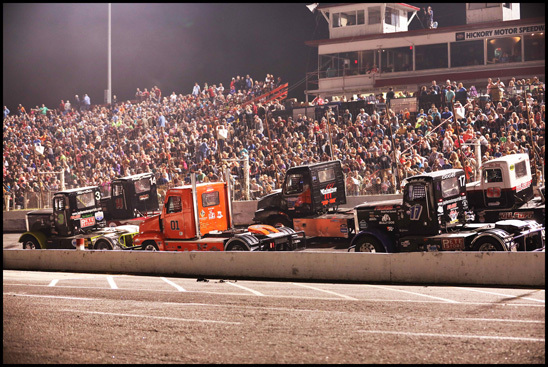 Fans can purchase tickets online, as well as register their truck for the Fan Series Truck Show.